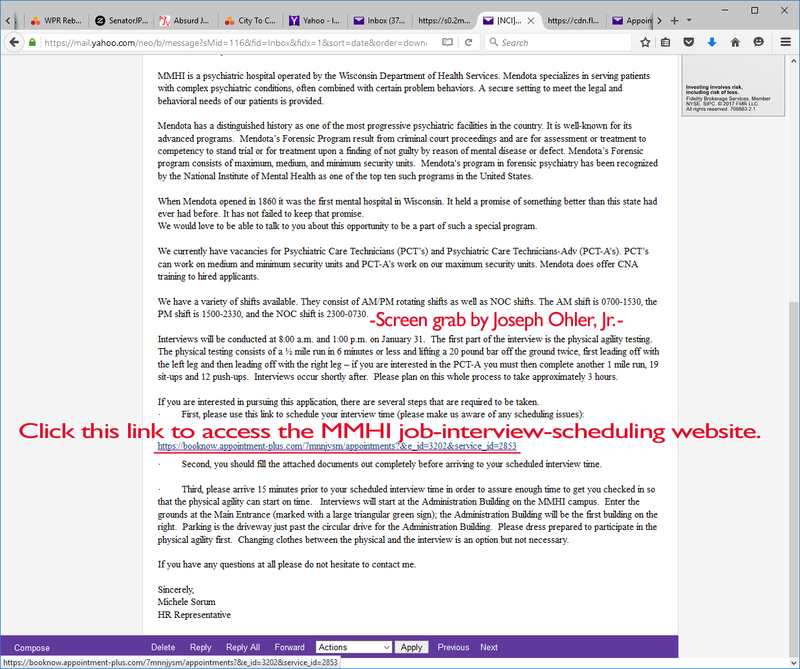 Job-Interview-Withdrawal Walkthrough for Those Interviewing for MMHI Psychiatric Care Technician « An Official Blog of Joseph Ohler, Jr. Tomorrow, I interview for Psychiatric Care Technician (and Psychiatric Care Technician – Advanced) — what was formerly called “psych-ward orderly” — at the Mendota Mental Health Institute. This means another perusal of my pre-interview checklist might be useful in determining forgotten steps in the process of making Joe Ohler the front-runner for this role. Lo-and-behold, I found a last-minute preparation that anyone else interviewing for psychiatric tech at the MMHI ought to do: I even made a walkthrough! 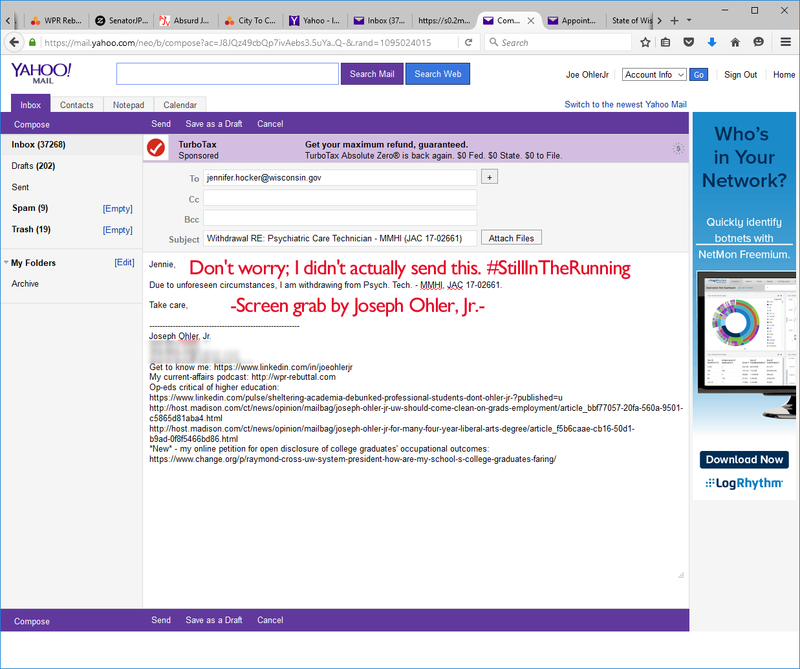 – All you need is to send an email to Jennifer “Jennifer” Hocker (jennifer.hocker@wisconsin.gov) with the subject line, “Withdrawal RE: Psychiatric Care Technician – MMHI (JAC 17-02661)” and, if you feel, a brief explanation in the email body (so that Jennie’s email client doesn’t mistake your otherwise-empty-bodied message for spam). 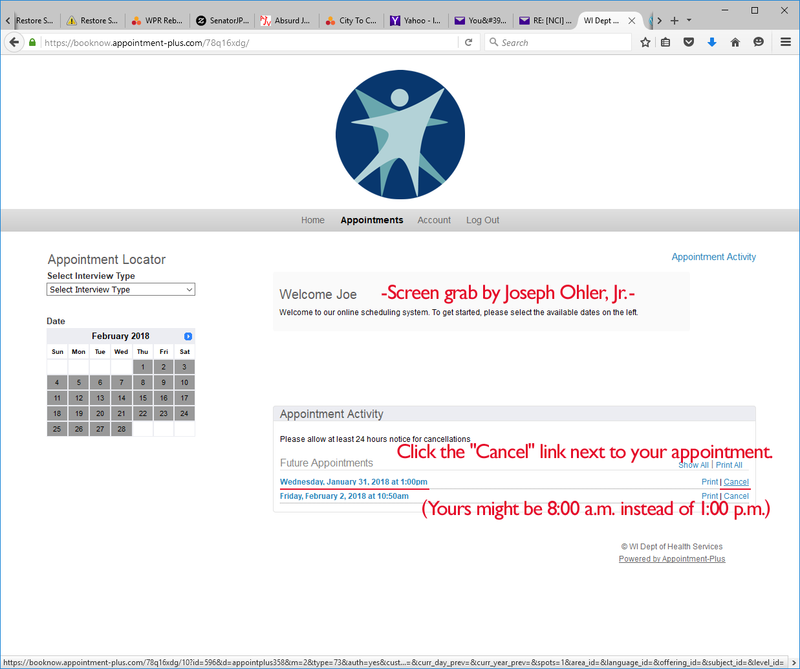 Step B1) – Find the appointment hyperlink sent by MMHI. 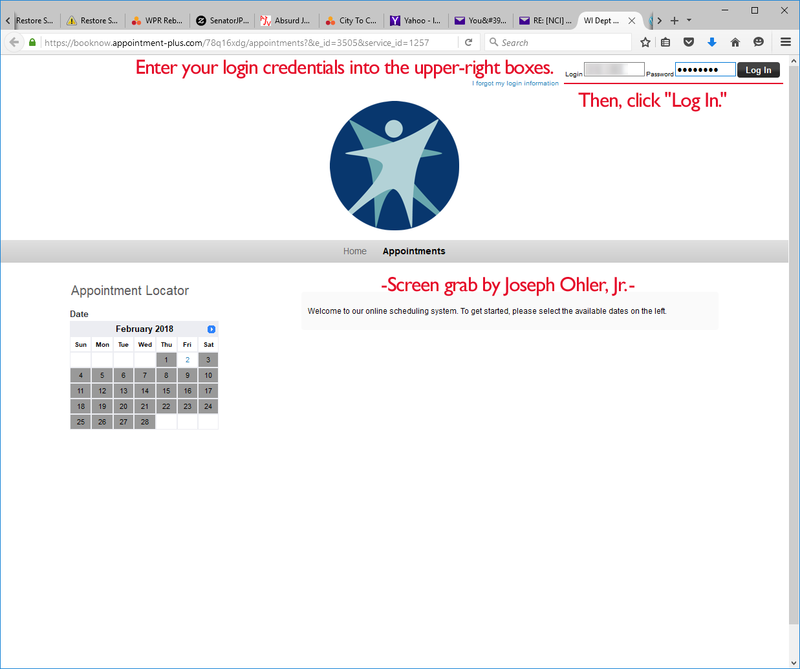 Step B2) – Enter your login credentials for the MMHI job-interview-scheduler portal. Step B3) – Identify, and click “Cancel” next to, the job-interview appointment you had at MMHI. 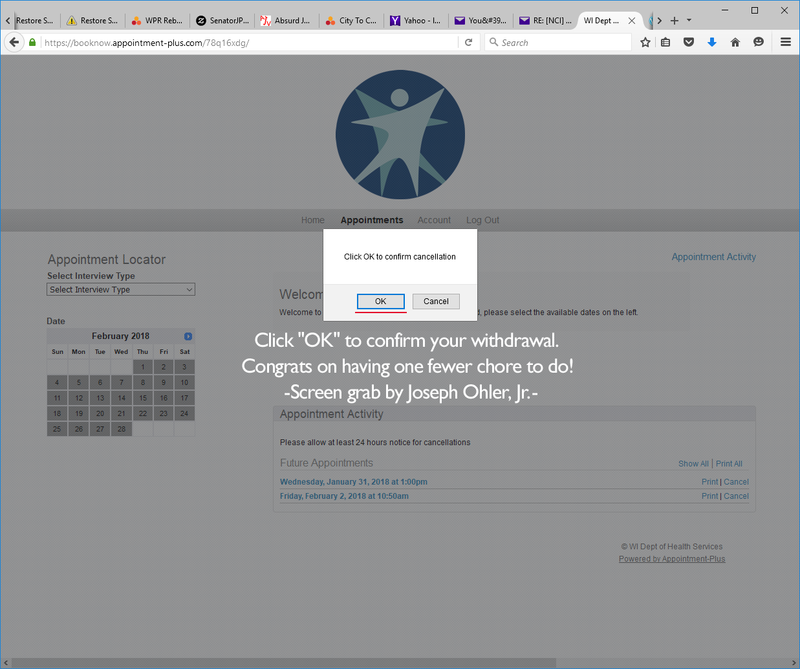 Step B4) – Click the “OK” button to confirm you’ve canceled your job interview at MMHI! – If you had the willpower to interview until seeing your competition in-person, at the physical agility test — or if you simply forgot to withdraw electronically — then you can still take yourself out-of-consideration by verbally telling the interviewer(s) that you wish to no-longer be considered. This entry was posted in Uncategorized and tagged "abandoning your job interview at MMHI", "canceling MMHI job interview", "confirm your withdrawal", "defer to Joe Ohler", "MMHI job interview cancellation", "no longer considered", "step aside for Joe Ohler", "take yourself out-of-consideration", "withdraw electronically", "withdrawing from job interviews with MMHI".